The Plague is a libertarian, advocating for a dog-eat-dog mentality and literally evoking the wild west as justification for his actions. Still, Hackers. Hackers came out when I was twelve years old and the closest I’d been to the internet was AOL and Prodigy and my family probably had a 14.4k modem. This was the point of my life where I was breaking my family’s computer, and then fixing it again, more or less every night after my parents went to sleep. 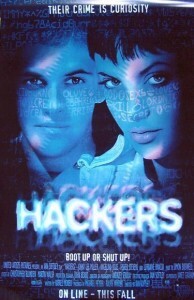 So I wanted my life to be like Hackers. And what’s not to love? It’s a movie about righteous teenage weirdos who listen to Orbital and roll around NYC on rollerblades like they own the place, giving absolutely zero fucks about the law. They shoot flare guns at security guards while dumpsterdiving and lie to corporate workers for the lolz. Okay, I mean, there are some things not to love. The one woman at the sausage party just kind of uncomfortably puts up with sexist banter, including by the protagonist who is both kind of a tool and unfortunately her love interest. Crossdressing is played for laughs on a few occasions. Racial stereotypes rear their ugly heads. But re-watching the film recently, the main thing that stuck with me was The Plague. That’s the bad guy’s name. I don’t even know quite how they did it, but the filmmakers managed to make teenagers rollerblading around fighting The Man and having funny names seem cool while a late-thirties corporate executive named The Plague skateboarding around town being evil just comes off as a doofus. Both The Plague and our heroes would be considered “black hat” hackers, in that they willfully break the law and do antisocial things with their hacking. But The Plague is a libertarian, advocating for a dog-eat-dog mentality and literally evoking the wild west as justification for his actions. He’s a greedy individualist. Our heroes, instead, are hacking for the fun of it and for a sense of camaraderie. They hack the government, not because the government is oppressive, but because the government is trying to stop them from hacking. They hack corporations, however, to stop the evil capitalists from destroying the world. They work together. They’re friends. They’re everything The Plague isn’t. It’s glorious.